There are lots of options, but it doesn’t have to be complicated. You need a sink, a stove and a refrigerator. You most likely want a dishwasher and a microwave. You need some storage and some workspace. You need room to walk. I really prefer a double sink. A single sink doesn’t save you that much space or money. My kitchen sink base is 30”. You really can’t get much smaller. All of the cabinets stick out 25” from the wall. A standard stove is 30” wide. So is the over-the-range microwave, which gives you a vent and a light. Refrigerators vary a lot. When I first remodeled, I put in a small refrigerator. This was a mistake. It was just really inconvenient. And when it broke, I could not find the same size, so I had to change the cabinets. If you leave space 36” wide and 70” tall, you will be able to fit any fridge easily. It comes out 33” from the wall. The dishwasher is 24” wide. In a perfect world, the dishwasher is right next to the sink. It makes life easier. In this drawing, I put the dishwasher between the stove and the sink, because that gives you some counter surface to work on. Standard base cabinets start at 12” wide. You can get smaller ones, but they cost more. 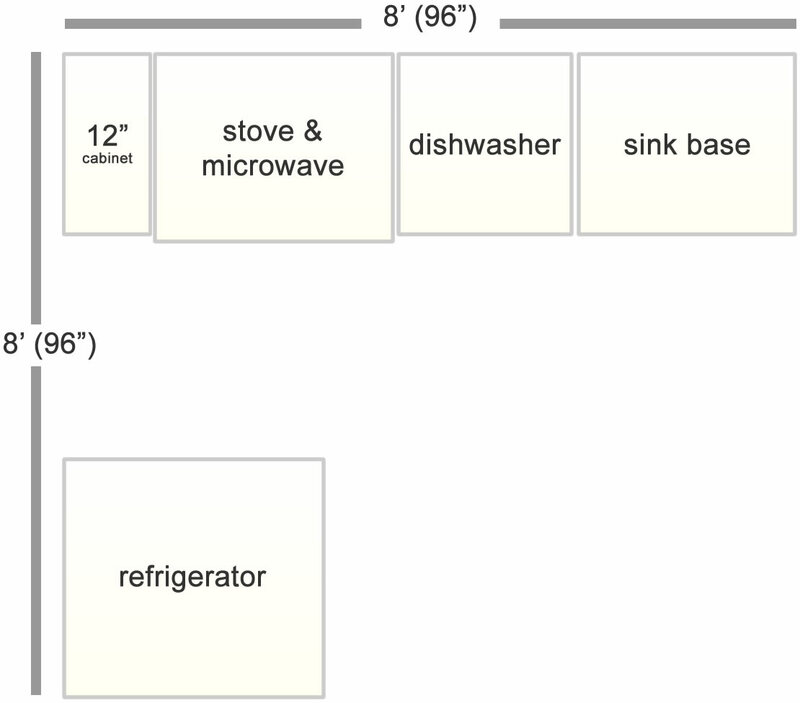 So, all added up, you have a minimum of 132”, 11’ if you put your whole kitchen on one wall. That leaves the sink at the edge. I would hate to have a sink jammed into the corner, so give that some thought. This is just to give you a minimum idea for standard sizes. More room for storage would be nice, too. You can put the fridge on the other side of a narrow kitchen. Then you would have 96”, 8’. You can put some more cabinet space, a table, even a pantry unit next to it. You need at least 3’ to walk through. Remember that you have to be able to open drawers, cabinet doors, the dishwasher and the fridge. These are absolute minimums. More room is really better. If you are trying to design the least expensive kitchen, don’t have corners. If you are going to turn a corner in the kitchen, there are three ways to do it. 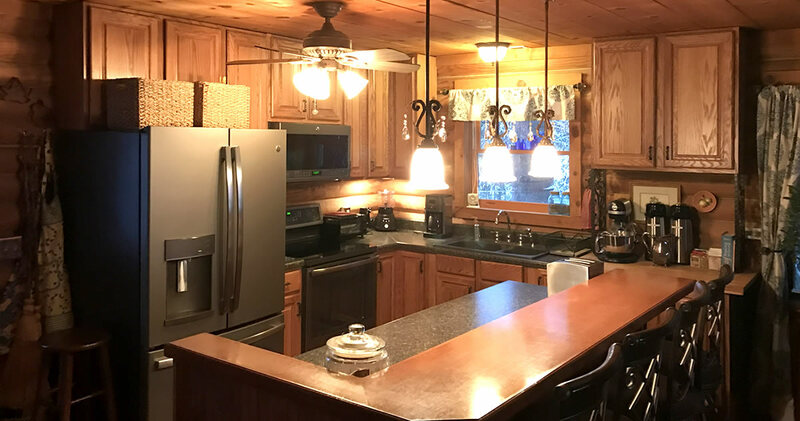 When I bought the cabin, this is what they had done. They put the cabinets against the walls and just left the corner empty. No storage at all. Just wasted space. They covered the hole with some beadboard. Temporarily, I hired a carpenter to open that space up for me, to make it more like the drawing below. A blind base cabinet gives you some access to the space from the cabinet next to it. It’s better than nothing, but this is really awkward storage. The advantage is, you can slide it to wherever you want to fit things right. And it is not very expensive. You can get a corner base that gives you two doors or one door that is hinged in the middle to get complete access to the corner storage space. This gives you the most usable space. The door can be awkward, though. These are available in a number of sizes. I selected the smallest corner base available, 36″ x 36″. I decided to order a kitchen corner base with a lazy-susan in it. The door is part of the lazy susan, so you push it like a revolving door. Don’t push too fast. Don’t put too much on it or things fall off into the space behind the shelf and it is really difficult to claw anything that falls off back out. If you are looking for the most storage, this is not your choice. 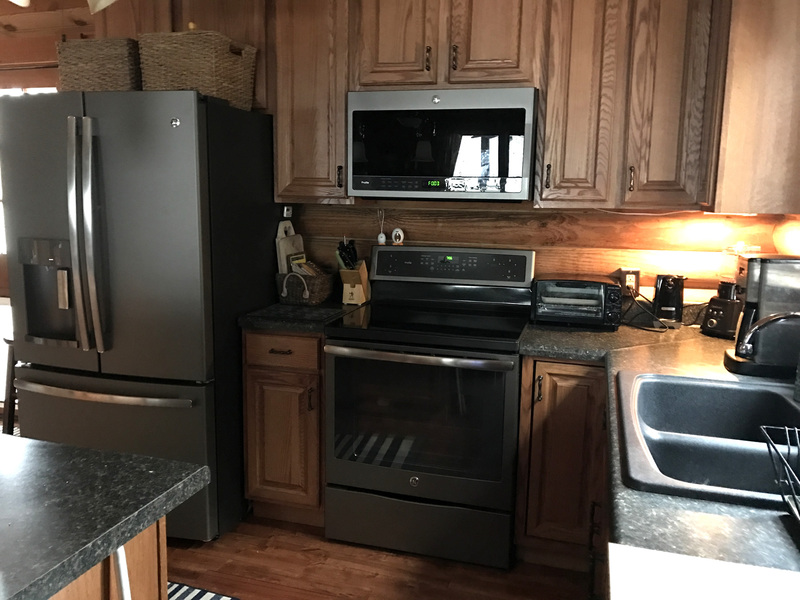 8’ x 10’ kitchen with plenty of counter space and storage. It’s a small kitchen. Much smaller than my last kitchen. But I have plenty of space to work. Even in a small kitchen, it is important to have some counter space on both sides of the stove and sink. 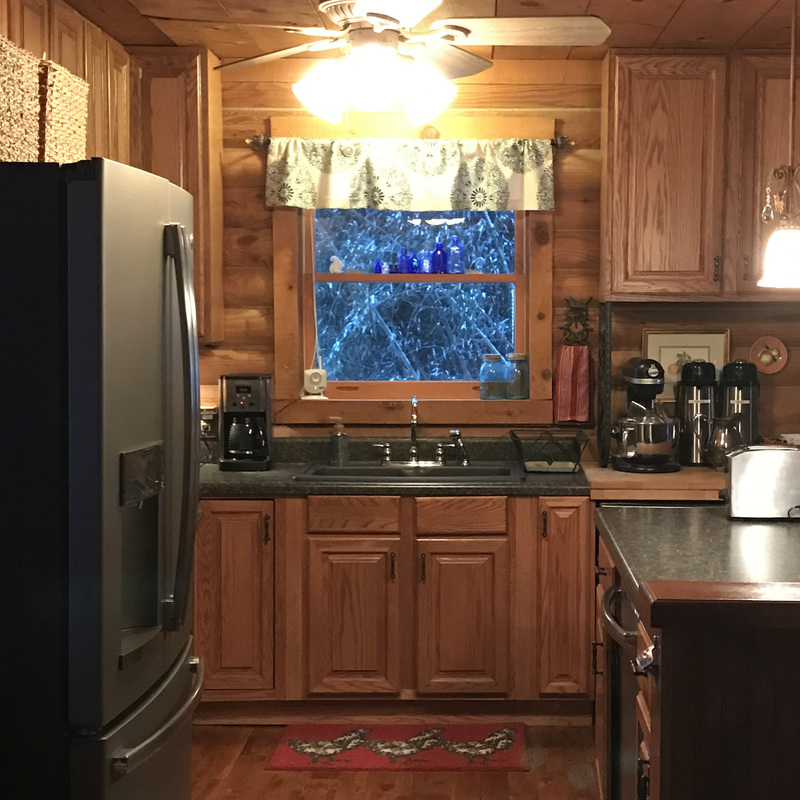 When complete, my kitchen fits into about 8’ x 10’ of my open floor plan. This leaves room for counter space on both sides of the stove and sink. I put a bar on the other side of the island. This gives additional seating and it obscures the counter top. I left 42” of walk space from the front of the fridge to the facing cabinets. Plenty of room to open the fridge, freezer drawer and dishwasher. This is plenty of room to open the fridge, freezer drawer and dishwasher and for two people to walk past each other. I was working around existing electric and water locations. By having the cabinets go to the ceiling, I got the most storage I could in the space. The island gave me some counter space. If you are starting over, it is going to cost a lot less if you don’t move the electricity or the water. Or the doors or windows. If you are starting from scratch you can put things anywhere you want. After all of my planning and all of my research, there was just no way to do what I wanted without spending much money. The less expensive cabinet companies do not have very many widths available. I kept starting with the corner, centering the sink and trying to fit things in, but it just did not work. To get the sizes I wanted, I had to go with rather expensive cabinets. It really did cost significantly more than I expected. But it’s done. And it fits. And I love it. Really love it! Research: Modular Home or Manufactured Home?